Debbiedoo's: Magazine copy cat challenge is ON! Well I sure have been a busy little bee! This I thought would be a fun challenge for us all to take on. It is not as easy as you would think. For my project, I had absolutely everything but the flowers. I bought all the flowers marked down because they were in some sad shape. I am not planning on them getting any better, but at least they looked nice for the challenge. Can I just say it is hotter than all HECK here. When I was taking these photo's I was dripping wet. Mike said I was just concentrating hard. I had my camera on setting P, however I was not crazy about the tint it sets off, so I changed it to Manual. This was a faux copper pot I had around. I had the pretty flower stencil, the white outdoor stencil paint, the Krylon Bahaus gold spray paint, and my mind set off in a tizzy! And there you have my magazine Copy Cat challenge. Have fun visiting one another as I do not anticipate this to be a super large party...which is good, no reason not to visit more gals and make some new friends. Please just LINK back to me, I do not have a button for this party...perhaps I will next time. Your picture looks better than the original!!! Awesome. I just walked in from getting the weekend manny and peddy. Of course, I have new Polka Dot toes. Blue with Red and White dots. Too cute, of course. So pretty and inviting! I love the fence sign the best! Hi Debbie, I love your copy! This was so much fun, I really needed something fun to do this week. Thanks for hosting. I hope you do this again soon. OK, I'm back... I forgot to mention when and if you ever get tired of your yellow basket, send it my way, it would be perfect with my TEAL one. And yes, it was mighty hot and buggy out there last night. But, you do have an eye and your's is sooooooooo much better than the one in the magazine. Ok, I'll leave you now to go check out the others. This is so inspiring! I am so busy right now but I can't wait to come up with something of my own. Your little tub of flowers is the cutest!! Whoa! You did ANOTHER magazine copy cat project... I thought that the wooden screen with the pots on it would be your entry but you have outdone yourself with the yellow planter. I hope you do this "challenge" again...I am already thinking of what I could do next. Woo Hoo, you know I've been looking forward to this! Thanks so much hosting this fun party! Your creation is outstanding, great photo skills! Love it! well done,, you're soooo crafty! This is sooo cute, Debbie...much cuter than the original. This has been so much fun. I hope you will do it again soon..maybe monthly...? ?....sure had fun. Debbie, that looks great and I will have mine up tomorrow. Fun challenge. Wow you have been really busy. Both projects are really cute! I'm glad I still have a couple days...this is such a fun idea and can't wait to tackle it! I've seen a bunch of my sidebar people are participating in this party!! How fun!!! 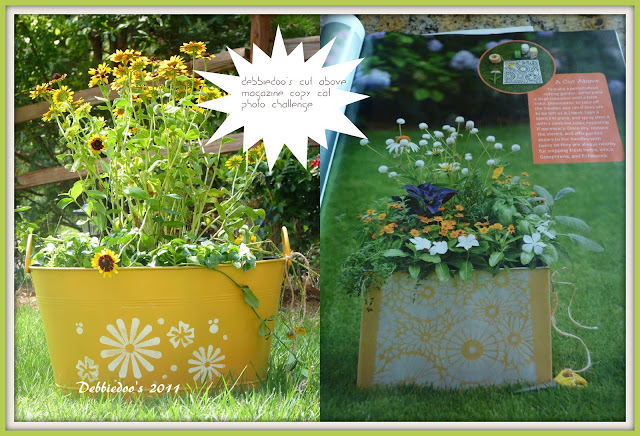 Your last magazine makeover with the woood and the blue pots was awesome and this one is even more awesome!! i must tell you how upset and dissappointed i am to not be participating in this. i had actually gone to the library and took out 13 magazines to read over this holiday weekend...but i looked thru them early, figuring what perfect timing. and there was nothing for me to copy! they were all country living, and i don't have anything that really fits that bill. ugh! believe me, i tried. oh well. i will be more prepared if you ever do another! This has been the funniest party I've been to in a long time. OK, I don't get to many parties, really. But, please let's do this again. That Tuscany crate is too die for cute and I so want one. Amazing what happens when I get out of that yarn bin. What a great theme for your party. I took some liberties with the challenge though and linked up an older post, as I'm going away tomorrow night for seven weeks so I didn't have time to do a proper challenge. I would love to join in again some time. Thanks for hosting it. You've done it again! You did an amazing job...all are great photos. Your bucket is far prettier than the one the magazine used too. Have a wonderful 4th of July!!! Hi Debbia, this linky is so much fun!! Not only is it fun to do, but so much fun to visit everyone. I love it, and hope you will do it again. If I ever have a linky party, it will be something like this.Such fun!! I was sooo looking forward to this challenge! I love themed linky parties, and this one was really interesting! If you hold another, I will be there! I think I picked up the same magazine! Once we got going on our "flowers" I noticed a coffee can in the shop as well... so this may have just inspired a whole deck make-over! DEBBIE! !...I got so busy reading and enjoying all the other copy cat's that I "plum" forgot to comment, I'm crazy like that, I get to jumpin' round from blog to blog and I'm get so excited looking at everyone's amazing creations, I kinda get caught up! !...But I wanted to tell you how much fun this was, thank you so much for coming up with these FUN ideas, you(and Mike) are two great mines, thinking together, and yall are double fun!...your copy cat is too cool, my favorite flower and my favorite color's too, you always delight my friend....Hey!...you know that first photo with the Honey Bee, could be FRAMED!! Love this and again thank yall for the fun, and all the fantastic idea's that make blogging INTERESTING! When I saw Ricki Jill's post this morning I knew this would be a fun challenge to do, and it was! Debbie, this is such a fun link party. I'll try to join in next week. I must admit I like yours better. Very pretty. Love yours! It's so cheery! Thanks for sharing and for hosting this party - it's such a fun concept and I had a blast with my copy. Super cute Deb!! I so wanted to do this, but am having a bit of a difficult week here. So at a later date I am going to do it on my blog, just for fun. My friend Kate's, with the poppy tablecloth, BLEW me AWAY!!! She is so freakin talented!!!!! This is such a fun post, and I will thoroughly enjoy reading to see what everyone did! Hot and sticky hugs from triple digit California to you! Awww, love it, wish I had time to join in this challenge and I hope you are able to do it regularyly. Keep inspiring us, love you! Love it! I like yours better than the magazine picture! That is so cute Debbie! It really IS better than the magazine! I've been so out of it when it comes to crafting, I haven't even started on my headboard:( I'm sad I didn't participate in this party but hopefully you do it again. Oh wow Debbie! I like your copycat much better than the original! I want to copycat your version! I am bummed I did not get to join the party. I worked late every night this week and did not remember about the party, let alone have the time. Please tell me you will be doing this again soon? Is this going to be a monthly meme? I want to join this party....I guess I'd better look through some magazines, huh? Your tub is very cute, Debbie. Wow Debbie this is a great copy!!! Can you send some heat here? I still have the heat on in the house for crying out loud !!! Hi Debbie, just linked up a Spring post, hope that's OK, great party!!! Hi Debbie! I just had to tell you how happy I am to participate in this...I've tried to link to parties before (not on your blog...you'll read why) with no luck - weird processes and my posts wouldn't show properly. So I gave up on being part of any of them. I just have to say yours is SO simple and it's awesome! Thanks for this party...it's great fun! Great job girlfriend! I love that tub...color and stencils, all of it. You really knocked the ball outta the park on this one! P.S. I've tried to comment for days...hope this one will work. I missed your party, I hate to have a party going on without me, I just could not get it together, but I have had so much fun looking at everyone. happy 4th! Thanks for the fun party, Debbie. Yes ma'am...you're my first! ;) Thanks, I appreciate it. Heck, maybe it'll make me blog on a regular basis! I always think of linking to your Newbie party, so maybe I'll do it! Well, this day totally got away from me, with Scott home and the house being cleaned...icks that cat's out of the bag. Any who? thanks again for this party it was totally fun and such an enjoyable change of pace for me. I promise to be back and check out more, but I need to get to bed. We are going to try for the Hot Air Balloon launch two towns over at 5a. Oh, the things we will do for a post. Have a great weekend and I will be back in and out when I can grab a moment. I simply LOVE that you are doing this and think it is such a wonderful challenge...can't wait to see what everyone comes up with! I hope you are having a lovely start to the weekend, Debbie, and that you and your beautiful family have a very Happy 4th!!! What a neat idea -- yours is much better than the mags! I've really enjoyed your party and seeing all the great "copies". I love your yellow daisy can. It looks so pretty on your deck, too. What a great idea for a link party. your tub of flowers turned out great. looks so pretty on your deck. We are heading off and will be gone visiting...but wanted to say Happy July 4th!!! Your magazine copycat turned out much better and just beautiful, Debbie. I haven't been over in a while Debbie. Wanted to pop over and say hello. This sounds like a fun party. Love the way your copycat turned out. Have a wonderful 4th of July weekend! Oops! I was so flustered, I forgot to comment on your post my dear! I love what you did with the tub. I think you did a great job copying but still keeping your own style to it! It looks wonderful! This is such a fun idea! I'm a little late now, but hope to involved the next time! Glad I found your blog. Love this party & thanks for hosting! So happy that I could Feature another Blogger. And I just heard back from her with a big OK! Love the idea for this challenge! I wish I had seen it earlier and I would have tried to join in. There are some awesome ideas shared here. Love your little planter! hi debbie- new follower. Please stop by my home page to see my sunflowers! I saw yours and thought "well I don't have a magazine copy project but my sunflower photos look like yours! I love this party idea so now I have to look for a really ugly magazine cover so I may have a shot. I LOL with the Martha Stewart cookie post!